Introduction: Recently, pure laparoscopic hepatectomy (PLH) has been spreading explosively. But the level of difficulty is various according to the tumor location. On the other hand, single port hepatectomy has been introduced recently. 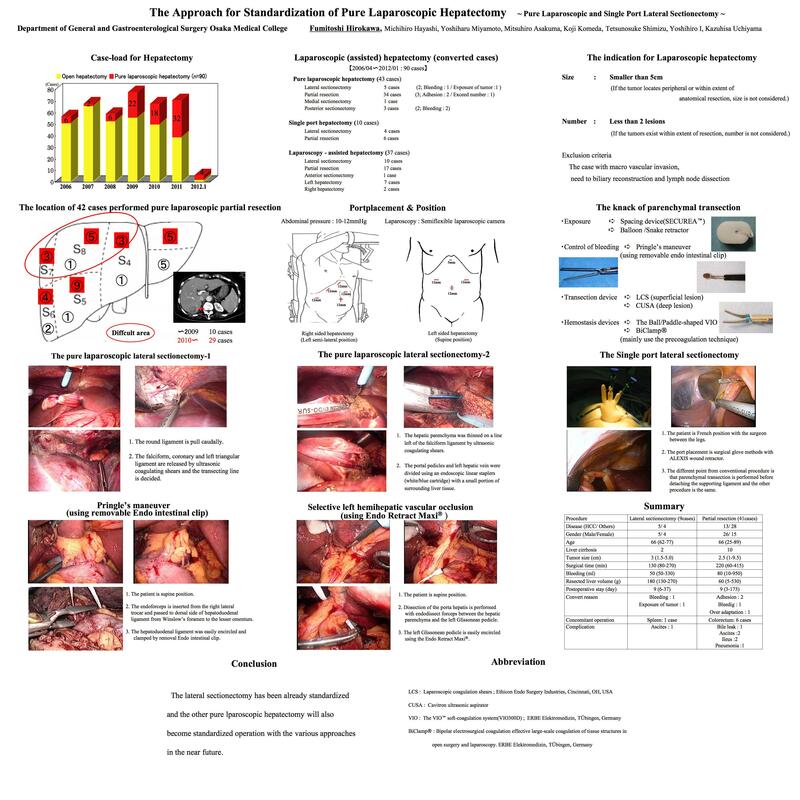 This presentation expresses the approach for laparoscopic hepatectomy at our institution. Material and Methods: Laparoscopic hepatectomy has been performed in 74 patients at our institutions. Nine patients were hemihepatectomy, 2 patients were posterior segmentectomy, 17 patients were lateral sectionectomy and 46 patients were partial hepatectomy. 40 patients were performed PLH and 34 patients were laparoscopy-assisted hepatectomy. Furthermore, single port hepatectomy(SPH) was performed at 8 patients. Results: The mean operative time and bleeding are 266min and 242ml. There were no post-operative complications in all the case, except 1 case of biliary fistula after pure laparoscopic S5 resection. Discussion: However, not all the cases can be a good indication for laparoscopic approach. If the tumor is located on the edge or surface of the inferolateral segments (Segments II, III, IVa, V and VI), the partial resection is relatively easy. But in the posterosuperior segments (Segment IVb, ? and ? ), the resection is difficult and in selected cases, it requires the small incision so-called “the with handport conversion”. Furthermore, it is hard to say that PLH has been established as standard operation, especially for the anatomical resection, such as hemihepatectomy, anterior and posterior sectionectomy. On contrary, for the lateral sectionectomy, procedure is simplified using the endo-lineal stapling device, unless the surgeons are not obsessive to expose the hepatic vein and Glisson’s pedicles just like open hepatectomy. Surgical time was around 90min and there were no complications, we consider, this approach will be a standard. In addition, we perform the single port surgery using the surgical glove and the semi-flexible laparoscopic camera from June 2009. If the cutting line is straight, single port hepatectomy (SPH) is feasible and useful with a little ingenuity. As a result, surgical time was around 150min and no post-operative complications. Finally, we present the knacks of liver parenchymal transection. We generally transect the parenchyma by Laparoscopic Coagulation Shears (LCS) within 2cm from liver surface and more deeply we normally use Cavitron Ultrasonic Surgical Aspirator (CUSA).Bleeding is managed by the soft coagulation system(VIO300D; ERBE Elektromedizin, Tübingen, Germany) and occasionally, clump crushing method with Biclamp? is used. The Pringle maneuver can be easily performed only to insert the laparoscopic forceps from right lower lateral port to under the hepatoduodenal ligament. And selective hemihepatic vascular occlusion is performed between the hepatic parenchyma and the Glissonean sheath at the bifurcation in the hepatic hilum, then the Glissonean pedicle is encircled using the Endo Retract Maxi?. Conclusions: The lateral sectionectomy has been already standardized and the other PLH will also become standardized operation with the various approaches in the near future.